A 17-year-old driver crashed into an Old Town liquor store after his car was struck by gunfire near the Division Street bar strip early Sunday, police said. The teen was traveling westbound on Division near Dearborn with a 17-year-old male passenger around 2:05 a.m. when a dark-colored, four-door Volvo sedan pulled next to them and someone in the second vehicle opened fire, according to police. 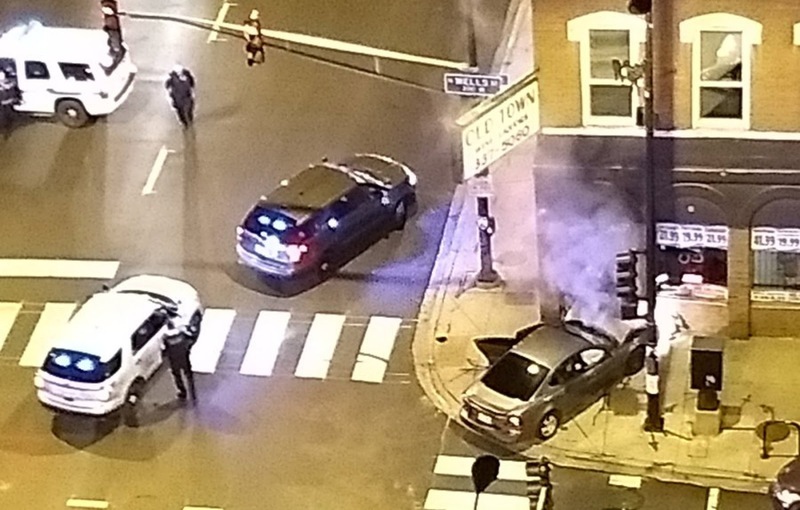 Officials said no one in the targeted vehicle was shot, but the driver lost control of his Pontiac Grand Prix and crashed into Old Town Liquors, 1200 North Wells Street, moments after the gunfire. Both occupants of the car were slightly injured in the crash. They were both transported to Northwestern Memorial Hospital in good condition. Police said they found a handgun in the crashed vehicle. The driver was arrested for unlawful use of a weapon. The Volvo that opened fire has dark tinted windows and was occupied by three or four people, according to a witness. It was last seen heading west on Division Street. Back CWB's reporting team and we'll reward you with members-only reports and services all year long. Join HERE for just $49 a year or $5 a month.